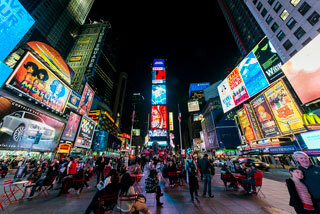 Times Square is a major commercial intersection, tourist destination, entertainment center and neighborhood. Brightly adorned with billboards and advertisements, Times Square is sometimes referred to as "The Crossroads of the World", "The Center of the Universe", "the heart of The Great White Way", and the "heart of the world". This article uses material from the Wikipedia article "Times Square", which is released under the Creative Commons Attribution-Share-Alike 3.0 License.